Congress leader Shashi Tharoor received six stitches on his head after he injured himself while offering prayers at a temple in Kerala's Thiruvananthapuram, sources said. He was weighing himself on a giant scale as part of the "thulabharam" ritual in which a person sits on the scale against a mound of offerings like fruit and sweets, equal to the devotee's body weight. Kerala is celebrating its new year Vishu today, with people across the state visiting temples to offer prayers. Immediately after he got injured during the ritual, Mr Tharoor was taken to a hospital in the state capital, where after applying the six stitches the doctors said the Congress parliamentarian is out of danger. "A heavy iron hook fell on my head when a temple Thulabharam scale gave way. Lots of blood but no apparent other damage. Thank God it didn't hurt anyone around me - could have caused a very serious injury," Mr Tharoor tweeted. 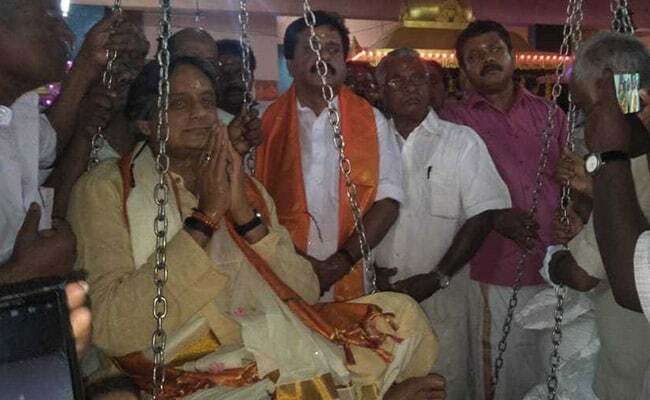 In a photo taken by those who accompanied Mr Tharoor, the Congress leader is seen in a crisp yellow kurta siting cross-legged on the scale, suspended above the ground by four iron chain links. Mr Tharoor is looking to score a hat-trick from the Thiruvananthapuram Lok Sabha seat. He faces the BJP's Kummanam Rajasekharan and CPI(M)-led LDF candidate C Divakaran. Following his long career at the United Nations, Mr Tharoor returned to India and was elected to parliament in 2009. Kerala will vote in a single phase on April 23 in the seven-phase Lok Sabha elections. Results will be out on May 23.